Saudi Arabia prevented the leading Saudi blogger, Fouad Al Farhan, from attending the event where he was scheduled to take part in a panel entitled “The Changing face of Arab blogging“. Tunisian human rights lawyer and online writer, Mohammed Abbou, was also stopped from boarding a flight, for the fifth time since his release from prison in July 2007. Tunisian journalist and editor of the online magazine Kalima Lotfi Hidouri, and Mazen Darwish, director of the Syrian Center for Media and Freedom of Expression, were also prevented from leaving their countries for Beirut. L. Hidouri was held by police overnight, before being released on the next day. In 2007, Fouad Al Farhan was arrested for unspecified “violation of non-security regulations.” He was released on April 26, 2008, after spending 137 days in detention in Jeddah. In 2005, human rights lawyer and onlineMohammed Abbou was arrested and sentenced to prison for three-and-a-half years for writing online articles criticizing the Tunisian penitentiary system, and comparing his country's political prisoners with those held in Abu Ghraib. He was jailed for nearly 28 months, and released on 24 July, 2007. When Tunisian bloggers suspected that the presidential jet was being frequently used for personal business by friends and family of the president, they used airport records to track its travels and compared it to official government records. Only one of ten trips proved to be official. Using Google maps, the bloggers illustrated their findings by “following” the plane in a video that was posted on YouTube and could be viewed within Tunisia. 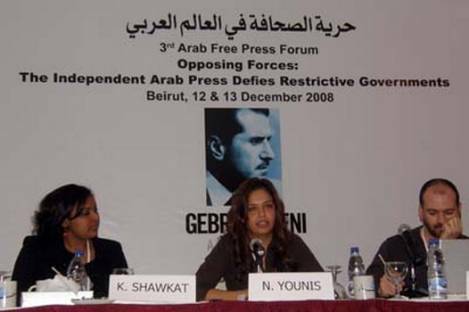 This and many other testimonies of how bloggers distribute information in the Arab world were shared at the 3rd Arab Free Press Forum, taking place on 12 and 13 December in Beirut, Lebanon. The second session of the Forum focused on the changing face of Arab blogging. The three presenters are all living and writing from outside their countries. Syria has imposed draconian restrictions on internet usage, requiring users to provide detailed identification and requiring internet cafes to keep records on the habits and site visits of all their users – and it blocks YouTube, Facebook, Wikipedia, Skype and other international sites. Despite these restrictions, internet usage in Syria – introduced only in 2000 — is growing, and is expected to reach 10 percent of the population by 2009. The number of Syrian bloggers is also growing, and they provide a vital service to the country, says Mr Al-Abdallah, who provided an evolution of the internet in Syria. Ms Shawat, who writes about female genital mutilation and other controversial topics, sees her role as providing a view of her country from a different perspective from official sources. Though censorship is strict in Sudan, the authorities have not been successful in blocking all opposition websites, says Ms Shawat, creating an opportunity for bloggers like herself. But she has another audience as well – the vast Sudanese diaspora – among whom she tries to encourage unity in a divided country. “Our national identity is important and I try to emphasize this in my blog,” she says. Tunisia has what may be the world's most sophisticated internet blocking apparatus – it not only block websites, it pirates them and adds false and misleading information. But that doesn't stop Tunisian bloggers for finding and using innovative ways around the system, and providing compelling multimedia reports to provide a counterpoint to official propaganda. When official media “reported” that the Italian region of Tuscany had named a major highway after Tunisian Zine El Abidine Ben Ali, bloggers photographed the new street, showing it was an insignificant rural road leading to nowhere. Suspecting that the presidential jet was being frequently used for personal business by friends and family of the president, bloggers used airport records to track its travels and compared it to official government records. Only one of ten trips proved to be official. Using Google maps, the bloggers illustrated their findings by “following” the plane in a video that was posted on YouTube and could be viewed within Tunisia. Bloggers have also found interesting ways of beating the censors, such as buying Google Ads keywords so their information pops up whenever someone searches for certain words. Mr Gharbia's presentation focused on the methods Tunisian authorities use to block independent information – including “deep inspection” of e-mails – and how freedom of expression advocates try to get around them.